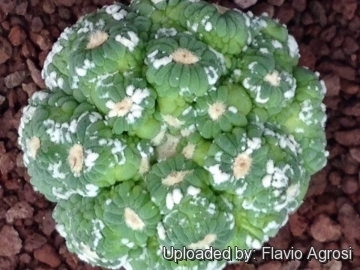 Description: Astrophytum asterias (a.k.a. Sea-Urchin Cactus or Sand Dollar) is an extremely flat barrel cactus with unique and remarkably beautiful form and no typical covering of spines, but with tiny speckled tuft of hairs less than pinhead-sized. 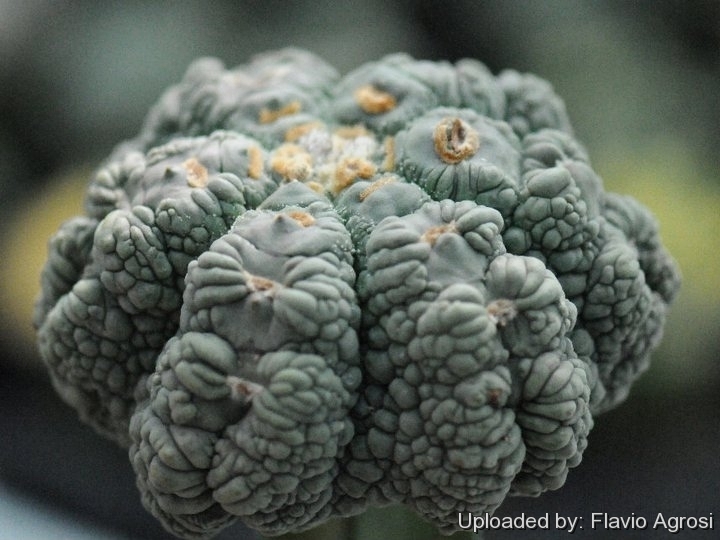 Many different odd forms and cultivars of A. asterias have been selected by Asian growers, are now available. Astrophytum asterias cv. Godzilla This is a very odd cultivars that combines the peculiar shape of Astrophytum asterias with a bumpy reptile-like skin. This cultivar is very rare and sought after by collectors, for its unique features. There are several forms mainly selected by Asian growers. Stem: Non-branched, much depressed, disc-shaped to low dome-shaped, grey-green to dull green (unless stressed), mature plants up to 7 cm tall, 5-16 cm broad. Ribs: Usually 8 broad, very low, irregularly bumped and reptile-like, woth wrinkled cross-grooves. The normal rib number eight is very stable but selected cultivars and hybrids can have from 4 to 13 ribs. Areoles: Round, prominent, 3-12 mm in diameters, felted to hairy, white, creamy, dirty-yellow till straw-coloured, then grey. Flowers: Apical, diurnal, radial, 3-5 cm long, 5-9 cm in diameter opening widely, yellow with orange/red throats. Ovary and tube very short, densely covered with thin, bristle-like, black tipped scales and with cobwebby wool in axils. Blooming season: Spring to summer and each flower lasts for one or two days only, but the plant may flower at any time during the warmer months of the year if adequate water is provided. 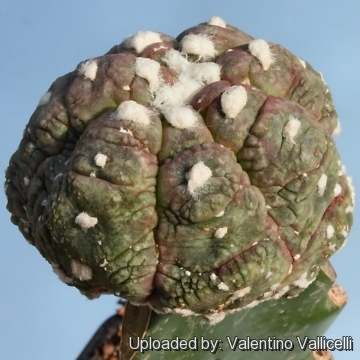 Fruits: Oval to round, about 1,5-2 cm long, green, pinkish or greyish-red densely covered with spines and dull-white wool, becoming dry and finally breaking off at or near base (not opening above the base). Seeds: Black or dark brown, glossy, bowl to helmet shaped about 2 mm long, 3 mm broad. 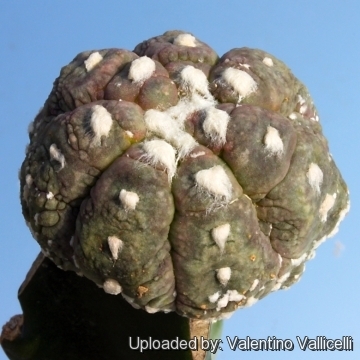 Cultivation and Propagation: Astrophytum asterias cv. Godzilla is not too difficult in a greenhouse, although grows quite slowly. It is usually seen as a grafted plant but can grow on its own roots too.